Our corporate video encompasses everything that we do on a daily basis, year in year out. From the seemingly impossible to the very smallest of request, Walter C. Parson will endeavour to fulfil your wishes. See for yourself why families choose Walter C.Parson. “Reflections” compilation DVD in memory of Pat May. As former Chairperson of Walter C. Parson, Pat played a big part in the history of our company, so it was a wonderful tribute and a poignant act that it was at her funeral service where we showed our first ever "'Reflections". “Reflections” compilation DVD in memory of Robert Dennerly, former Vice-Chairman of Plymouth Argyle Football Club. I am writing on behalf of my family and myself, the wife of John Walker who died on the 25th June. His cremation and Service of Celebration was on Wednesday 18th July at Western Mill and Holy Cross Church in Newton Ferrers. We have been helped fully by your Ivybridge team, and I feel it appropriate to let you know how kind and helpful they were. Keith and Shona did everything they could to make John's passing good and right by assisting us with the arrangements. These times are very sad, but the gentleman who carried John from our home after his passing - were gentle and caring as were Keith and Shona and the gentlemen who carried John into the Crematorium, and our Chauffer who kept the following cars in close contact. So I want to thank you and your team for making such a day so special by wrapping us all in softness. I want to express my thanks for your incredible professionalism and kindness when you dealt with my husband Mark’s funeral and arrangements. You came to our home and you were calm, witty and empathised so well. On the day, everything went to plan, just as you said it would. Please thank your colleagues also. I would like to thank you for the excellent way in which you carried out your duties at my Uncle’s funeral. Being ‘of a certain age’, I have attended many funerals in recent years and have never been so impressed as I was with the way in which you and your ‘gentleman’ handled Fred’s funeral. Before contacting you I had already had many people tell me that Walter C. Parson was the best and I too am now of that opinion. Your professionalism is outstanding. I wanted to write to express my thanks to your team over the last few weeks. From the time we contacted Harriet on the 9th November she has been brilliant. On our first visit she was extremely professional and compassionate and had the ability to talk to both me and my children at the appropriate levels. She guided us through the procedures and was able to meet all our expectations. We were kept fully informed at all times. One of my visions was when Gina passed in St Luke’s that she didn’t look like herself. With the aid of a photograph and clothes, Harriet managed to bring Gina back to me and my final visions live with me today and always as I have always known her and I can’t thank you enough for that. The day of the funeral and the journey to the crematorium was a truly memorable day and my faith in the human race was restored with the respect given by the public. I would also like to thank Henry who opened the Chapel of Rest at a couple of out of hours times. You’re lucky to have such a good team working for you, and would finally ask you pass on my and my family’s thanks to all your team. I just wanted to convey my thanks for the excellent order of service for my father's (Kenneth Fogg) funeral, which took place today. Seeing it in its intended form allowed me to appreciate its layout; you certainly know your craft. Thank you also for ensuring that those last minute alterations were made. It’s 9pm and we’ve just finished the washing up! Now we have the chance to quietly reflect on the day, and all agree that Mother would have been more than pleased with the send-off we have her. There’s something else we all agree on too; and that’s the fact that you and your team were spectacularly good, and at every point we have had contact with you and your team, we have felt like we are the only people you are dealing with, that’s not easy to achieve. So, a huge thank you from us, to all of your lovely team, for making the whole process so much more manageable and smoother than we had imagined it could be. At such a terrible time, WCP were absolutely fantastic. Harriet at Crownhill was in charge of my Mum’s funeral and was so professional, friendly and warm to deal with. She guided me through everything I needed to make a decision on and made the whole process as simple as possible. Even when I would call and speak to the lady on reception, she knew exactly who I was and who I was referring to, I think that shows an exceptionally high level of customer service. Not having to give a load of details and explain things over and over was something that made the process easier for me. Highly recommend the services of WCP to anyone who suffers a loss in their family. 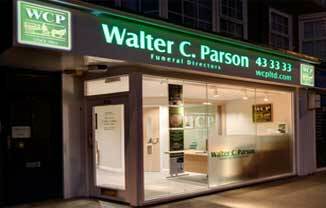 To top it off WCP were significantly cheaper than a well known chain of funeral directors! An exceptional business and the team at Crownhill are a credit to the company. Thank you on behalf of myself and my family for everything. We just wanted to express our sincere gratitude for everything you and your staff did for us regarding our mum Margaret Shannon's funeral service at such a difficult and emotional time your professionalism and personal approach made things so much easier to bear. From the first phone call to the collection of mum from warwickpark nursing home. We all knew she was in good hands. A very big thankyou to shaun who organised everything for us,to the staff who made mum look so beautiful. Her order of service was outstanding and the Rev Kevin Bridges was outstanding on the service he gave. Lastly we would like to thank all the staff at The Firs Crownhill Branch for their help and professionalism throughout this very sad occasion. Sincere gratitude from Mr & Mrs Keith.Shannon. I wanted to express my sincere thanks to you all for the help and support you gave me personally during what has been an emotionally draining time, and following that the brilliant way the funeral itself was conducted. So many little details, and it all came together last Monday absolutely splendidly. People came from all corners of the world to honour a man who was so highly respected in all aspects of his life. But from the sadness of his passing, the messages I have received have been of a brilliant and memorable occasion, all thanks to you all. Thank you to you all at Walter C. Parson for the help, compassion and professionalism. You made a difficult and sad time a lot easier. I write on behalf of myself and my whole family to express our personal thanks to you and your team of staff for all their kindness and support during our recent bereavement. Dad being a Naval man would have been mightily impressed with the precision and dignity with which it was executed as indeed are we. An avid timekeeper his arrival at the entrance to the church as the clock struck 1.00pm would have made his day and will be a lasting memory of the day for us all! You can be justly proud of your whole team. As a family we are extremely grateful that we chose Walter C. Parson for the peace of mind that a job well done has brought us all. Thank you once again. Walter C. Parson has a sterling reputation for the services it provides in its field and since its establishment has, I am sure, made funeral arrangements for many thousands. Yesterday you completed arrangements in respect of my mother and none of those you have conducted in the past could, as far as we are concerned, have been carried out without more regard for the deceased or for those who are left to mourn her. All that you did was executed so professionally and with the utmost dignity. The service was exactly as we, and more especially Mum would have wished. Many that I spoke to afterward commented how unusual “Reflections” was and that it was such a fitting tribute to one they all loved. On behalf of the family, particularly Christine and myself, I wish to thank you most sincerely for what you did." I am writing to you on behalf of my daughter Avril, my son-in-law Stephen and myself to acknowledge, praise and put on record our thanks to David and the team at Pengelly Funeral Service in Saltash for the service we received following the death of my dear wife Molly last month. In all our meetings and telephone conversations with David and his colleagues we were afforded support, outstanding politeness, caring attitudes, assistance and above all dignity. Nothing was too much trouble for any of your team that we had the pleasure of dealing with during this sad time. With our thanks and gratitude. Thank you for your kind words and understanding to our family at this sad time. Sincere thanks to all the Pengelly Staff at Saltash for their outstanding support. We wish to extend our heartfelt gratitude to our Funeral Director, Ayesha, who shared our pain, gave us comfort when we most needed it and gave us the strength to carry on. Ayesha thoughtfully took care of everything during this most difficult time and orchestrated the perfect day for our family to say our final farewells to our dear Son and Brother. Special Thanks. Appreciations also for your colleagues who produced the moving Service Sheets and "Reflections" affording our family cherished memories of him. In conclusion we recognise that Pengelly of Saltash went the extra mile, providing a compassionate and thoroughly professional Service. My family and I, would like to thank you, Alan and your colleagues for today. The service you provided was excellent and carried out to such high standards which showed how professional you are. Not knowing what to expect when I first walked through your door that first time a couple of weeks ago, you were kind and supportive of me and nothing was too much trouble for you. You helped to make the day special for mum and ourselves and I thank you whole heartedly for this. Just to say thank you for all that you have done for us following the loss of mum, Patricia Chapman. You had a tough job in that dreadful weather. We are very happy with your service and delighted to recommend you. Just a line to thank you for the way you looked after us, taking us through Mum’s funeral arrangements. So many things to think about, and just knowing someone is seeing to it all makes such a difference at a time like that. We really are so grateful to you for all your care. Our sincerest thanks. Dear Mr Ware, I am writing on behalf of my family and myself, the wife of John Walker who died on the 25th June. His Cremation and Service of Celebration was on Wednesday 18th July at Western Mill and Holy Cross Church Newton Ferrers. We have been helped fully by your Ivybridge team, and I feel it appropriate to let you know how kind and helpful they were. Keith and Shona did everything they could to make John’s passing good and right by assisting us with the arrangements. These times are very sad, but the gentlemen who carried John from our home after his passing – were gentle and caring as were Keith and Shona and the gentlemen who carried John into the Crematorium, and our Chauffer who kept the following cars in close contact. I would like to thank you for making sure Thursday ran so successfully. The order of service leaflet needs a special mention. You made a superb job of it. Both of my brothers were very moved by it, so thank you for all your support and help. Thanks again for making the day run so sweetly, the team are superb and you should rightly be proud of them, the care and attention to detail they showed was immense, I know I am a demanding customer and yet every tiny detail was met with a smile and welcomed, I really commend each and every one of you for that, from top to tail the service received was 5 star just as my Teresa deserved and I had hoped for her, my every wish for her has been delivered. I write to thank you for the kind consideration and the help you gave us over the funeral arrangements for my son Morley Howell, and for the dignified and unfussy way you conducted your part in the funeral service. My thanks also go to whoever for the help and efficiency with the service sheets. I was also pleased with the choice of coffin. Your very professional services certainly helped me and my family through a difficult time. I am writing on behalf of the family and friends of Moira Cory to thank you for your services in relation to her funeral last week. We found Walter C. Parson to be friendly, efficient and highly professional and the arrangements you put in place could not be faulted. In consequence, the funeral was conducted from start to finish just as my mother would have wished. You provided the same service for my father in 1990 and your standards are as high now as they were then. I am glad we engaged you for this important service. Please pass our thanks also to Davina and other members of your team at Plympton. There aren't enough words to express our gratitude for making the arrangements of my aunt's funeral so easy for us. We had so much confidence in you that we knew instantly that the day would run smoothly. It takes real skill to empathise with the many different emotions of grieving families and your judgement of us and our needs was spot on. The people who came, most of whom we had never met, felt that it was an appropriate way to say goodbye to her. It was lovely to meet her elderly friends and hear their stories. Please thank Kevin too who delivered his part perfectly. If such an occasion could be called a perfect day, that's how I feel. Thank you to everyone at WCP but especially you. On behalf of my family and myself, I would just like to take this opportunity to thank you for your help and support. Without exception, everyone from your team conducted themselves throughout in such a professional and dignified manner. We are extremely thankful of your kindness and understanding. I wanted to just drop you a line to express my sincere thanks for your kindness and professionalism before and after Fred’s funeral. The whole experience was made so much easier and it was comforting to know that Fred was in such good hands, and with such respect shown by all members of your team. Everyone who attended commented on the smoothness of the service and in particular comments were made about the reflections screen, how lovely a touch that was, indeed many of the congregation has never seen Fred as a young person! I would like to thank Lesley in particular for her kindness and help with all the arrangements, but special thanks to you personally for attending the funeral yourself. There have been so many positive comments made from family and friends. What can I say, had this been a wedding, they would have been saying the best ever. Your professional and caring nature was evident throughout the whole process, and whilst in your own words after the cremation, “it’s what we do”, it’s also the way that you do it. You are an absolute credit to your profession. It was an absolute privilege for us to work with you and your colleagues during this difficult time for us and I cannot thank you enough. From my heart, Thank You so much for being there for us. We would like to express our deepest gratitude and appreciation for the support shown to us following our Mother's death. You were compassionate and professional throughout planning and the actual funeral and we are deeply grateful. I wanted to convey my sister and I's thanks to Martyn Hall for all he did to make my mother's funeral go so smoothly. We really appreciated the warmth and kindness that Martyn showed in helping us with deciding the arrangements, and on the day itself. He kept us well informed throughout. My sister was particularly glad of his gentle encouragement to take the funeral flowers home with us, as she was able to make beautiful small bouquets for close relatives to take home. Many sincere thanks for all the help you gave me after the death of Brian, you both made a very sad and distressing time a lot easier to bear. I would like to thank the team, and you in particular for arranging such a professional funeral for my lovely wife Annette. I had confidence in you from the very start and you made me feel at ease throughout the arrangement process. This was such a comfort in what was a traumatic time for me, and my appreciation is heartfelt. We wanted to express our heartfelt thanks for the excellent service we received from your company regarding the cremation of my father, Geoffrey Devereux, which took place at Exeter Crematorium on 5th February 2016. We were particularly impressed by the support offered to us by James Oxenham who is such a lovely, caring person. Please pass on our special thanks to him. The complete service given is highly professional in every way at a difficult and stressful time and gave us comfort and support.